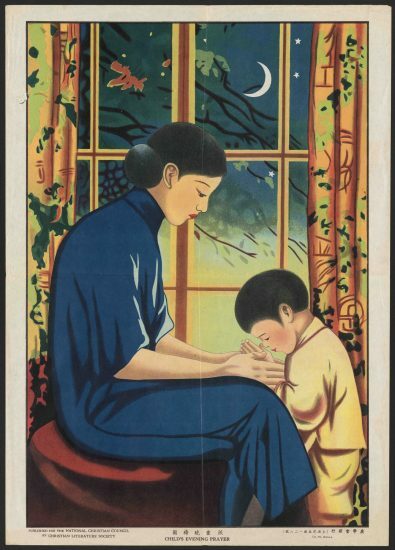 The title of this poster is called Men’s Prayer Pictures, which is a comic-based poster in the form of a nine-square grid. I believe that it is called Lianhuanhuain China. The painting style is similar to Lianhuanhua from the Republic of China, such as Sanmao. The characteristic of this art form is that although the image is often accompanied by words.People can understand the story even through the pictures themself. 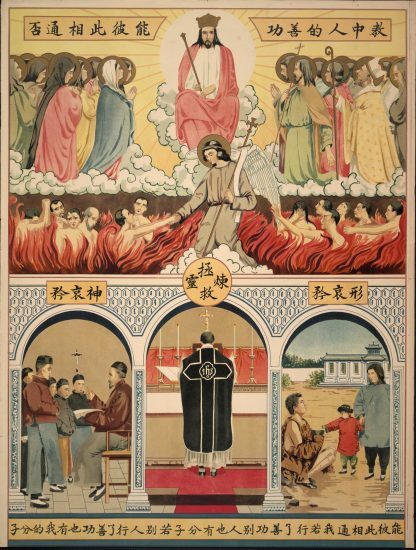 In this poster, these nine pictures represent the life of a typical agriculturist Christian. Whether he is sowing, fertilizing, or grazing, cutting trees, he is praying all the time. The content of this poster expresses the importance, inclusiveness and universality of Christian prayer. The text of each picture is a prayer of the different content made in the corresponding activities. The core idea is to let Christians remember the importance of prayer all the time and to persuade people to pray. This is a typical doctrinal question and answer type poster, and it is consistent with the characteristics of the times. We should know that even a large number of cities were established during the period of Republic of China, most people still live in farming life. This is a poster about the doctrine question and answer. We can see that this poster has some elements of Byzantine painting. For example, the characters on the painting are more facial, and the painting does not pay attention to the proportion of the human body. We can see that there is a very obvious aura behind God. These are the characteristics of medieval works. In addition, the composition of this poster mimics the medieval church mural style. We can see that the upper and lower parts are separated, the mortal is in the lower part, God is in the upper part, which simulates the relationship between mortal and heaven. His apostles saved the mortal from the hell. The text in the poster is a question and answer about the discipline of people doing good deeds. This poster with a very Western art style, especially, a Byzantine art style make me feel surprised. We know that Christian posters must be related to its target group. The two on the left are very easy to understand, especially the second one, with almost no text. Moreover, the contents of the two pictures on the left are completely life-like. 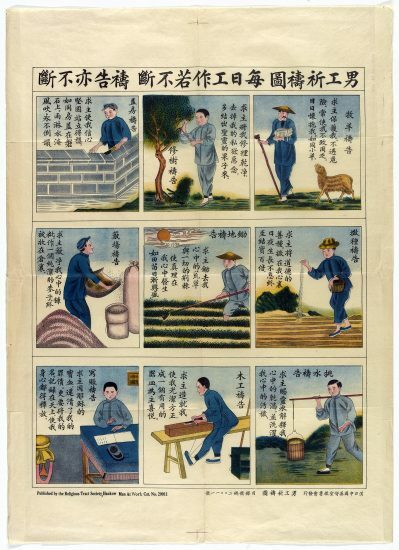 For example, the first picture shows many elements of farming life, and the middle one is obviously a prayer for expressing the family. Although the right side is also relatively easy to understand, we can see that the hell in the middle part is in stark contrast to the paradise where God is, and the discipline that can be saved by good deeds is what it wants to express, I think it is more difficult to understand than the left two, mainly because it has no elements of daily life. The three paintings are actually very different from each others. The first poster’s target is obviously a rural Christian. In the second one, we can observe that the mother and the child actually live in the city because the woman is sitting on a sofa-like chair, this is impossible in rural areas. The third one is using a lot of western painting techniques and contents, with the characteristics of medieval paintings to express the content of the doctrine.